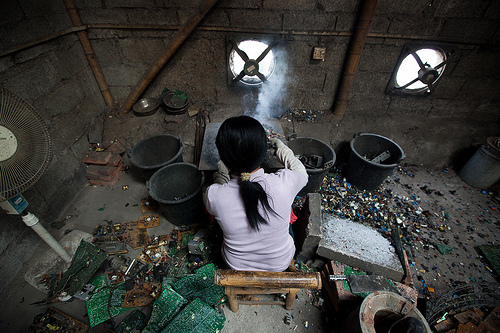 A worker cooks computer motherboards over solder to remove chips and valuable metals at a makeshift e-waste workshop. Ghana does not regulate the importation and management of electronic waste, or e-waste. The government hopes to have rules in place next year, he said. Sampson, a Ph.D. student at the University of Ghana, was involved in testing the school and other areas in Accra near the Agbogbloshie scrap metal site, where more than 100 people break apart and burn electronic trash by hand to obtain valuable metals like copper. Schoolchildren as young as six years old work around bonfires of circuitry, plastic and other leftover high-tech trash, he said. A nearby produce market, a church headquarters and a soccer field were similarly polluted, to varying degrees. The soil around the school site had measurements for lead 12 times higher than the levels at which intervention is required. Lead is acutely toxic to children and can permanently damage their growing brains and nervous systems, even at very low levels of exposure. “We don’t know what the immediate health impacts are. We are hoping to test the children’s blood for contaminants but we have not secured the necessary funding,” Sampson said. International shipments of electronic trash are outlawed by the Basel Convention. However, European and North American e-waste is often shipped as “electronics for reuse” or hidden with legitimate cargo.